Second screen adaptation of David Mamet's play Sexual Perversity in Chicago. Danny (Ealy) and Bernie (Hart) are thirty-something buddies, working together as sales reps for a Los Angeles restaurant supply firm. While Bernie is a loud mouth womanizer, Danny is shy and retired, scarred by his recent breakup with Alison (Patton). When Bernie arranges a double date involving his equally loud current squeeze Joan (Hall), Danny and Joan's friend, the smart and sophisticated Debbie (Bryant), the latter two quickly hit it off. Their relationship progresses quickly, with Debbie moving into Danny's apartment, but it soon hits the rocks as the couple grow to resent one another. David Mamet's 1974 play, Sexual Perversity in Chicago, was originally adapted for the screen in Edward Zwick's 1986 About Last Night, starring Rob Lowe and Demi Moore at the height of their brat pack fame. That film also featured Jim Belushi in a supporting role as Lowe's obnoxious "comic relief" friend, a character archetype that has since gone on to become a staple of comedy drama. The role of the obnoxious buddy is usually to provide emotional support for the lead while at the same time encouraging them to make decisions that may not be in their best interest. The director of this second adaptation of Mamet's play, Steve Pink, previously adapted Nick Hornby's novel High Fidelity for the screen back in 2000, and employed this buddy archetype in a role filled by Jack Black. Pink got it right that time, giving us a buddy who was at first obnoxious but ultimately charming, like a girl who insists on tickling you while you're attempting to make a serious point that's not really all that serious after all. As director of About Last Night, however, Pink has completely misfired with his buddy, mainly due to casting. 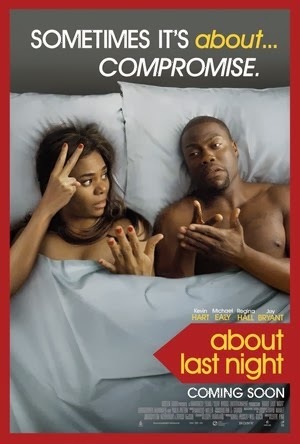 In the role of Bernie, Kevin Hart goes beyond obnoxious and deep into the realms of irritation. The same can be said for Regina Hall, playing the buddy role to Bryant's Debbie, and coming off like one of the characters she's essayed in the brain dead Scary Movie series. Conversely, Ealy and Bryant make for a highly likable couple, both possessing a natural charm that makes you root for this adorable pairing. Their roles are a positive step forward in the screen portrayal of African-Americans, with none of the negative stereotypes we see so often. Whenever Ealy and Bryant are onscreen, the movie is a success, an insightful look at the struggles of maintaining a relationship, but when Hart and Hall appear we're back in Stepin Fetchit territory, derailing the entire movie in the process. Remove the latter two and you'd have a quality adult relationship drama. As it is, their presence infects the movie to its detriment and it's far from credible that these people would ever be friends in reality. We're just over two months into 2014 and already Hart, the most irritating screen presence in modern cinema, has appeared in substantial roles in three wide release movies. Ealy, on the the other hand, a quality actor who possesses real charm, has had to settle for a career of bit parts. It seems in modern Hollywood, the only way for a black actor to get near the throne is to assume the role of court jester.